The new MONARCH 7 30mm binocular features a new, sophisticated body design that is lighter and more compact. Its improved optical system features 30mm objectives, a wide apparent field of view and Nikon’s ED (Extra-low Dispersion) glass lenses. The sharp, crisp views of the MONARCH 7 are now even more portable and more convenient to take with you on your next adventure. 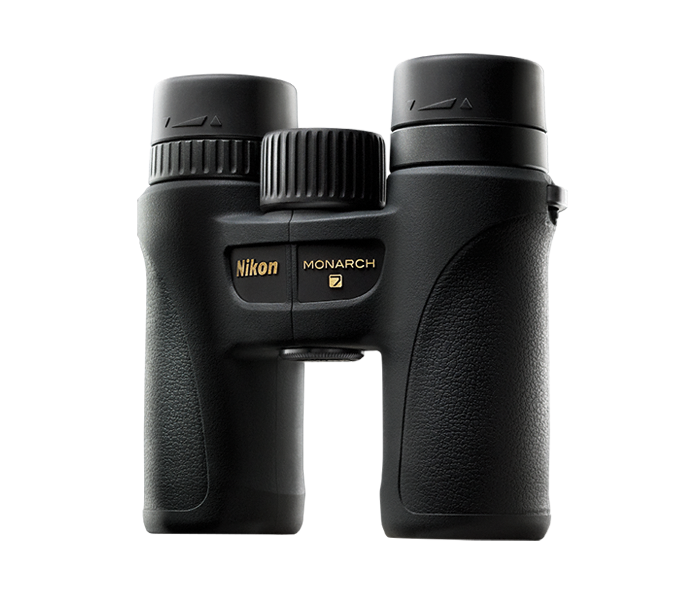 The MONARCH 7 30mm binocular features Nikon’s legendary ED (Extra-low Dispersion) glass lenses that effectively compensate for chromatic aberrations to provide images of superior contrast and outstanding resolution. The dimensions of the MONARCH 7 30mm binocular are 4.7 inches long by 4.8 inches wide, making it more portable than ever before. Thanks to a fiberglass-reinforced polycarbonate resin, it’s extremely durable, yet lightweight. Applied to all lenses and prism surfaces, this technique provides almost the same brightness as that perceived by the naked eye, and clear high-contrast images that display accurate color reproduction. The turn-and-slide rubber eyecups with multi-setting click stops allow users to adjust the eye-relief for a custom fit - providing a full field of view and maximum comfort during extended periods of use. Multilayer coatings, which provide an even higher light transmittance across the entire visible light spectrum, are applied to all of the lens and prism surfaces that transmit light. This minimizes the loss of light due to reflection, thereby ensuring a more natural, clearer view. With this simple and intuitive design, bringing objects into focus has never been easier. MONARCH 7 binoculars are Nitrogen filled and O-Ring sealed for complete waterproof and fogproof performance. With an apparent angular field of view of more than 60 degrees, the MONARCH 7 30mm binocular makes it easy to find your subject. MONARCH 7 binoculars provide high-resolution images with extremely accurate color reproduction, thanks to phase-correction coated prisms.